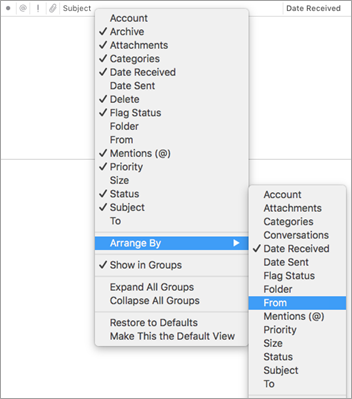 Most customization options are available on the Outlook menu bar and ribbon. If you don't see the menu bar, you're probably in full-screen mode. Hover your mouse near the top of the screen to make the menu bar visible, or click the green button at the top left to leave full-screen mode. Select All Accounts in the upper left, and then click Inbox. Select Outlook > Preferences > General. Select Show all account folders. Select Hide On My Computer folders. Select Organize > Reading Pane. Select Right, Bottom, or Off. To change the size of the reading pane, rest the pointer on the border between the reading pane and the message list, and then drag the border to the right or left. Select Organize > Arrange By, and then select an option. The available columns vary, depending on the type of items in the list. Columns work best when the reading pane is hidden or positioned below the item list, so select Organize > Reading Pane > Bottom or Off. Select View > Columns, and then click a column name. Columns in the current view are identified with a check mark. To rearrange the columns, click a column heading, and then drag it to a new position. To resize a column, rest the pointer on the right edge of the column header until the pointer changes, and then drag the edge. Under Personalize, select Colorful or Classic. Whether your messages are set up to display on the right or on the bottom, you can organize email by sender simply by clicking the Arrange By menu on the Organize tab and selecting From. If your reading pane is set up to show messages on the right, at the top of your message list, click the By menu, and then select From. If your reading pane is set up to show messages on the bottom, right-click or Ctrl+click anywhere in the message column header section, and then select Arrange By > From. Select Home > Filter, and then select an option. How do I change the font size of the folder list and email list? 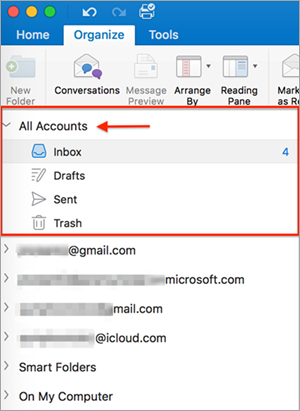 See Change the font size in Outlook for Mac for instructions. How do I change the size of the buttons? You can't change the size of buttons at this time. How do I add buttons to the ribbon? 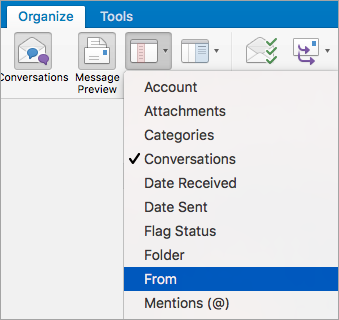 It's not possible to add or remove buttons on the ribbon in Outlook for Mac. 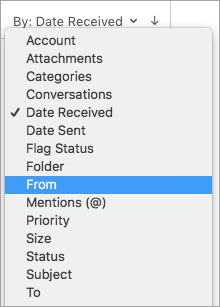 If you'd like to request this feature, please visit the Outlook Suggestion Box. How do I change the look of unread messages? Press and hold the Control key while clicking the mouse button. It's not possible to show the calendar in the reading pane. Select the calendar icon at the bottom of the page to see the calendar.